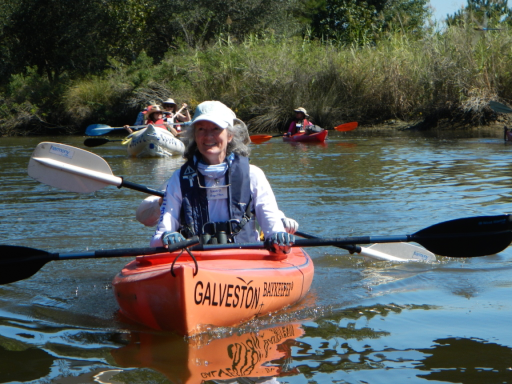 Vaness Hamilton and Mary Milby long time members of Galveston Baykeeper paddling the Galveston Baykeeper canoe on the East Fork of Double Bayou. Among the group were many interesting group of paddlers actively involved in water-related activities. The trip leaders, Tom Douglas and Linda Shead, recounted stories of life along Double Bayou during years gone by, including how nearly everything had to be transported here by water, since bridges over some of the bayous weren’t constructed until well into the twentieth century. Yet more history came to light during a brief stop at the end of Haynes Road, and, later, during a visit to the mouth of Double Bayou, near the community of Oak Island.